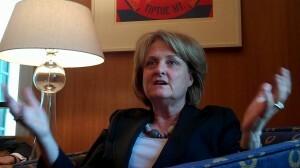 Judith A. McHale, undersecretary of state for public diplomacy and public affairs. Judith A. McHale, undersecretary of state for public diplomacy, said in an interview with The Washington Times that “a very narrow segment” of the world’s population is at risk of turning to extremism, and the policies adopted by the Bush administration should be broadened. Ms. McHale also said “we can’t take our eye off the ball on violent extremist elements [because] they are very real and dangerous enemies to us.” But “you risk offending people by creating the impression that we think they are going to go that way, when in fact they don’t,” she said. The Obama administration has come under criticism in recent weeks for deliberately avoiding the words “Islam,” “Islamic” and “jihad” in reference to terrorism in order not to offend foreign audiences. Several government documents conspicuously omitting those terms have surfaced, prompting accusations of White House censorship, though at least one was published at the end of the Bush administration. Sen. Joe Lieberman, Connecticut independent, called that practice “absolutely Orwellian and counterproductive to the fight that we are fighting.” Unless the U.S. government is “honest” about the nature of its enemy, “we are not going to be able to defeat this enemy,” he told Fox News on Sunday. Ms. McHale said she has “not been told to stay away from certain words” and their use depends on the particular context. She said the administration supports counter-terrorism outreach abroad, but those programs are “appropriately targeted” at potential extremists in schools or neighborhoods. Former Bush administration officials and analysts said that, despite certain perceptions, Mr. Bush’s public diplomacy was not dominated entirely by countering extreme ideologies and actions. “Ms. McHale overstates the case here,” said Helle Dale, senior fellow for public diplomacy at the Heritage Foundation. He suggested that the previous administration might have emphasized countering extremism to secure better funding for public diplomacy programs from Congress, even when those initiatives had little to do with anti-terrorism. At that same hearing, Mrs. Hughes and Mr. Glassman cautioned against an obsession with “being liked” by foreigners, which Mrs. Hughes called a “fundamental misunderstanding” of the purpose of public diplomacy. Ms. McHale said that is not what she is trying to do. This entry was posted in Diplomacy and tagged American Academy of Diplomacy, Barack Obama, Bush administration, Congress, Connecticut, Diplomacy, extremism, foreign policy, Foreign Service, George W. Bush, government, Heritage Foundation, Islam, jihad, Muslim, Obama administration, public diplomacy, State Department, terrorism, White House. Bookmark the permalink.